Our getting started guides will get you started running Point of Sale Transactions in a matter of minutes. In these getting started guides we walk you through many of the initial functions of the software including: installing Wolf Track Point of Sale Software, how to login to Wolf Track Point of Sale Software, entering your first ticket, checking out a customer, issuing a refund, and opening/closing the register. 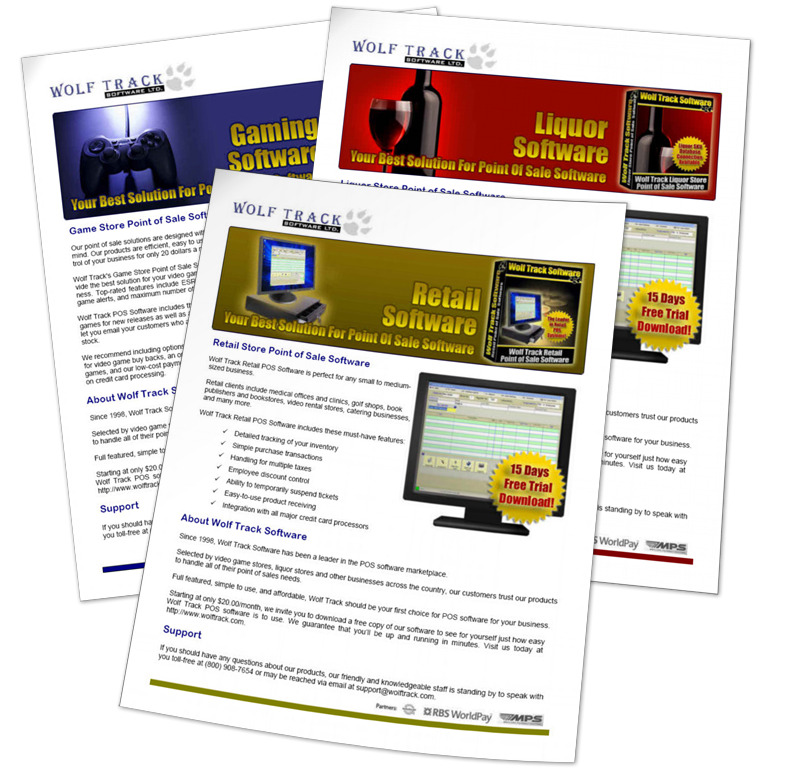 Wolf Track Product Sheet let you see quickly what Wolf Track Point of Sale Software has to offer. They are also a great way to give other store owners information about Wolf Track Software. Get a free month of Wolf Track POS Software for referring another store to Wolf Track Software. Call us now toll-free at (800) 908-7654. Not only can you use Mercury Payment Processing for free gift card processing but you can also set store credit in the Wolf Track Point of Sale Software. "With Wolf Track Software I know exactly what is in my inventory at all times." "I love the way this software just works!" Wolf Track Software appreciates all of our customers that were involved in helping us receive the Cool Tools Gold Award. Thank You.